Crochet head wraps are a must-have in your crochet pattern library. They work up quickly, allowing you to create instant gratification projects, whip up last-minute gifts, or practice new stitch patterns without investing a lot of time. Headwraps are small crochet projects that can be used for stash busting, using up yarn leftovers from other projects. Crochet head wraps come in a variety of designs, including headbands, ear warmers and more, so you can make a whole lot of these crochet accessories without ever getting bored. Plus, they add a pop of color and style to any outfit while simultaneously keeping you warm and keeping your hair off of your face - cute and functional at the same time! If you haven't ever crocheted a head wrap, it's time to get started! These ten free crochet head wrap patterns will set you on your way. When you're finished with these, you might also want to check out patterns for crochet scrunchies. Mamachee designed this beautiful bow-shaped head wrap crochet pattern, which she worked up in a variety of jewel tones that offer a great pop of color to any outfit. What a great accessory! The design is super cute, but it's also easy to crochet, since it basically consists of half double crochet worked in the back loop only. The shaping is done by using single crochet and slip stitches to reduce the height of the center portion of the head wrap. Mamachee shows how to make the head wrap in single colors or in multi-color versions. This is a 12-round crochet head wrap that is wider than most headbands and ear warmers. It is great for cold days. There is also a baby head wrap free crochet pattern to match so this is a great choice for a mommy-and-me accessory set. This free crochet ear warmer pattern by Rescued Paw Designs has some similarities to the Mamachee crochet head wrap pattern. It, too, has a bow shape and is made in part with half double crochet stitches worked in the back loop only. The shaping is done differently on this one, though; a center portion is added to create the bow. This crochet pattern also has fewer rows than the one by Mamachee, so instead of a head wrap it's a narrower headband-sized crochet pattern. Working both of these patterns will give you a great idea about how to make your own crochet head wraps, tweaking the design to suit your style. Although Moogly calls this an ear warmer pattern, the design is wide enough to make it a full crochet head wrap. It's a beautiful thick design that is perfect as a Valentine's gift or accessory. However, it could be worn throughout the year, especially on chilly days. The beautiful heart designs definitely stand out. This pattern uses primarily basic crochet stitches along with some post stitches to create the fabulous texture. 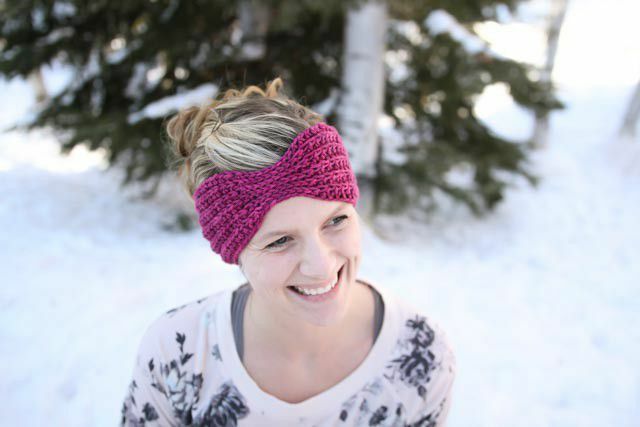 Indie FiberArt designed this simple, yet beautiful, chunky crochet headwrap free pattern. It is made with thick yarn, such as Lion Brand Homespun, and a large (size M/N) crochet hook, so it works up super quickly. The look is bulky in the best way and yet streamlined as a simple accessory made from only a few rows. This crochet pattern uses single crochet and half double crochet and uses back loop only stitches to add some interesting texture. If you're wondering why so many of the crochet head wrap patterns use back loop only stitches, it is probably because these stitches add a lot of stretch to the items that you're making, which is perfect when you crochet something like an ear warmer that need to wrap around your head and fit snugly to stay on. Although back loop stitches are a great way to achieve the right fit on a head wrap, they aren't the only option. Another way to do it is to literally wrap the piece around your head, as we see here in this boho-inspired crochet head scarf designed by Crafty Hippy. This is a super simple crochet pattern, and it shows you how any skinny crochet scarf pattern can be adapted for use as a head scarf. Head scarves have a slightly different style appeal than other types of head wraps and might be perfect for music festivals, summer accessorizing and gifts for the modern boho chic girl! This is a headwrap that works well in the spring and summer months. You get two-in-one with this free crochet head wrap pattern because it is a reversible pattern that looks as good inside out as it does right side up. And you get even more than that because it comes with a matching free crochet pattern for wrist warmers. Make these in school colors to show some team spirit. 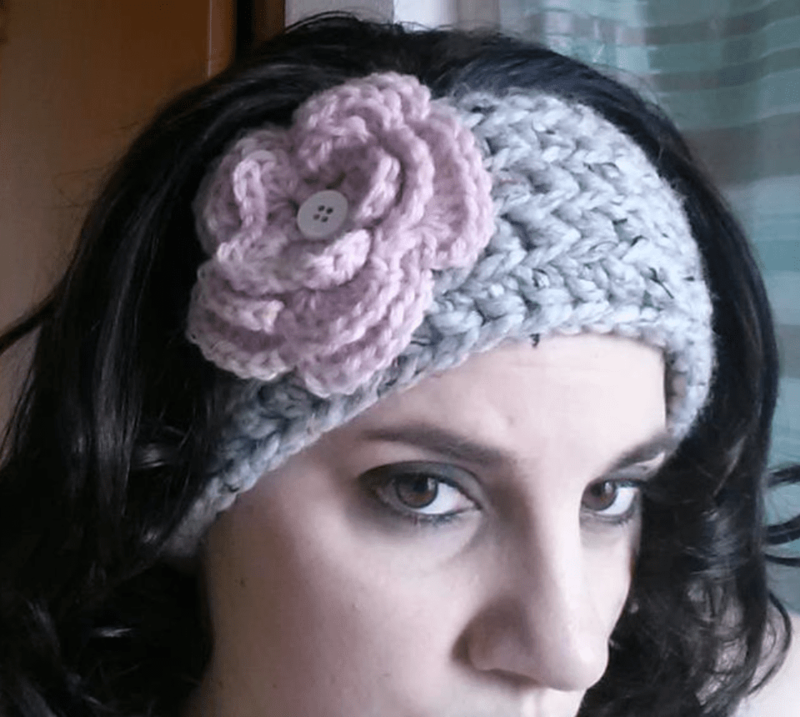 Add a flower to a crochet ear warmer to make it stand out from the crowd. This free pattern includes a three-layered flower that brings texture and dimension to the design. It's a wide ear warmer that works well as a headwrap. Usually, the wide part of a head wrap is on top of the head and the part underneath may be narrower but that trend is reversed in this cute design. (Of course, you could wear it the regular way as well). This crochet pattern is worked in beautiful broomstick lace, so you can practice that niche while making a great accessory. The kerchief is a popular type of head wrap that we don't see often enough in crochet. This one is worked using the very unique crocodile crochet stitch, a textured stitch that is fun to play with and one that makes a great thick head wrap. BobWilson 123 created something unique and different with this free head wrap crochet pattern. It is actually a crochet hat pattern, but it is made loose and slouchy, in such a way that it is intended to wrap around the whole head and hair. This makes it a hat that has the flavor of a head wrap. It is a creative design! This crochet pattern, available by video, includes excellent exact instructions for measuring the proper circumference for your hat pattern. Plus, it adds information for measuring your hair if you have dreadlocks. The hat is designed using only basic crochet stitches including single crochet and double crochet, so it's an easy pattern to work with.